Code changes without compile (courtesy of the, also hugely exciting, new compiler Roslyn). Cross platform ASP.NET in collaboration with Mono. Open Source, the entire vNext project is open source. While I love code changes without compile as much as the next developer I think points 2 and 3 are the most exciting in terms of how Microsoft develop and release software in the future. The unprecedented level of transparency around these projects finally puts to bed the Microsoft vs. Open Source community disputes. One of the best server side languages (ok, I use it for a job so I'm biased) is now available for all developers on all platforms, though this might lose Microsoft some licensing costs for Server OSes and Visual Studio licenses it also opens up the majority of servers (which are not running MS OSes) to ASP.NET (not to mention, who on earth chooses not to use Visual Studio if it's available). Scott Hanselman definitely describes all the new features better than I ever could, so head on over to his site to read more. That's enough about why vNext is great. How do we actually get it up and running? The instructions on the Git Repository are probably the best on how to install. The vNext project is available as a Git repo, so in order to get it you need to have Git installed. Installing Git for Windows is extremely easy, thanks to these guys. I have changed the entire site to use url routing, but haven't quite finished yet so there's a lot less content than the old site. For absolute beginners setting up Python on Windows can be a bit daunting. There used to be a great guide for setting up a development environment on the Sad Phaeton Blog which is sadly now defunct. I will try to emulate the brilliance of that guide but if you want another guide there's one here. There are currently 2 main releases of Python, Python 2.7 and Python 3.3. There are some differences in the language between the two and the support for external libraries is better in 2.7 just by virtue of it being older. We'll use Python 2.7 in this tutorial. Download it here, I use 32 bit Python (Python 2.7.5 Windows Installer) because the installers provided for third-party libraries tend to look for the 32 bit version. You can trick these installers into using the 64 bit version by editing the Registry but unless you're going to be using huge datasets 32 bit should do for you. Run the installer using the default settings. I tend to install to the directory (C:/Python27). 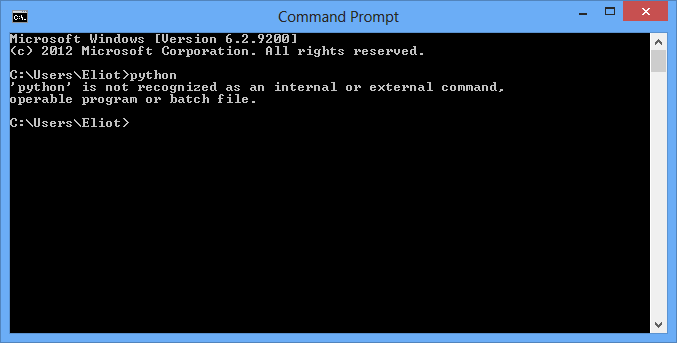 If we open the Windows command prompt (run "cmd") and type "python" we get the following response.